Pre Draft Report: Coming out of college (Alabama) Morgan’s delivery and arm action were reminiscent of Cliff Lee. His fastball sat 90-92 with a slider and change up that both flashed average. He threw a ton of strikes and had good control of the zone. However, the numbers he put were not as good as was expected for a pitcher of his caliber. The Phillies ended up taking him in the third round. He projected as a back of the rotation starter going forward. Career Synopsis: Morgan signed early and went directly to Williamsport. He put up good numbers in his 53.2 IP with a line of 2.01 ERA, 1.04 WHIP, and 43 K (K/9 7.21). Going into the 2012 season Baseball America rated him the #29 prospect in the system noting that he could move very quickly through the system. 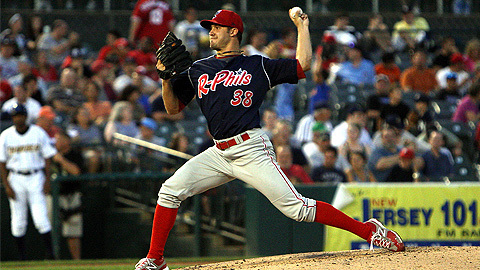 The Phillies double jumped him to Clearwater to join fellow lefties Jesse Biddle and Austin Wright. Morgan proceed to put up some of the best numbers in the FSL, leading the league in strikeouts (he ultimately would lead the league in strikeout rate at 10.17 K/9) before earning a promotion to Reading. At Reading his BB/9 increased and his K/9 returned to his 2011 level but he still continued to put up good numbers. His numbers at Clearwater over 117.2 IP were 3.29 ERA, 1.08 WHIP (league leading), 133 K which earned him the #12 ranking in the FSL from Baseball America. At Reading his numbers over 35.2 IP were 3.53 ERA, 1.15 WHIP, 29 K. After the season Baseball America rated him the #5 prospect in the system, Baseball Prospectus rated him #3, and Keith Law rated him #1. Summary: When healthy Morgan was looking like a major league #3 starter, with a solid 4 pitch mix. The stuff is not overpowering, but he was able to locate it and keep hitters off balance. With the injuries his fastball velocity was way down and hitters were able to hit his secondary stuff at will. Without the fastball velocity he profiles more as a backend starter or long reliever.